Like the hot air balloon and the green buds of Spring “and still we Rise” Happy Resurrection Day!!! This was the last text message I received from my godmother, Shelly. She sent it to me Easter morning two years ago. The next day, she passed away. Shelly wasn’t my godmother in the traditional Christian sense but she was a part of my family for more years than I can remember. When I first received the news, I was shocked. Shelly hadn’t been sick and wasn’t in the hospital. Then, I was in a state of disbelief. How could this be? Was she really gone? Finally, I reached acceptance. I accepted the fact that she would be with us forever, maybe not in the physical, but as long as I had my memories of her, no one ever really dies. Memories of Shelly are throughout my apartment, two of my favorites, of course, deal with food. Hanging over my desk is a piece of paper she had created to go with her Sweet Potato Peace Pies. 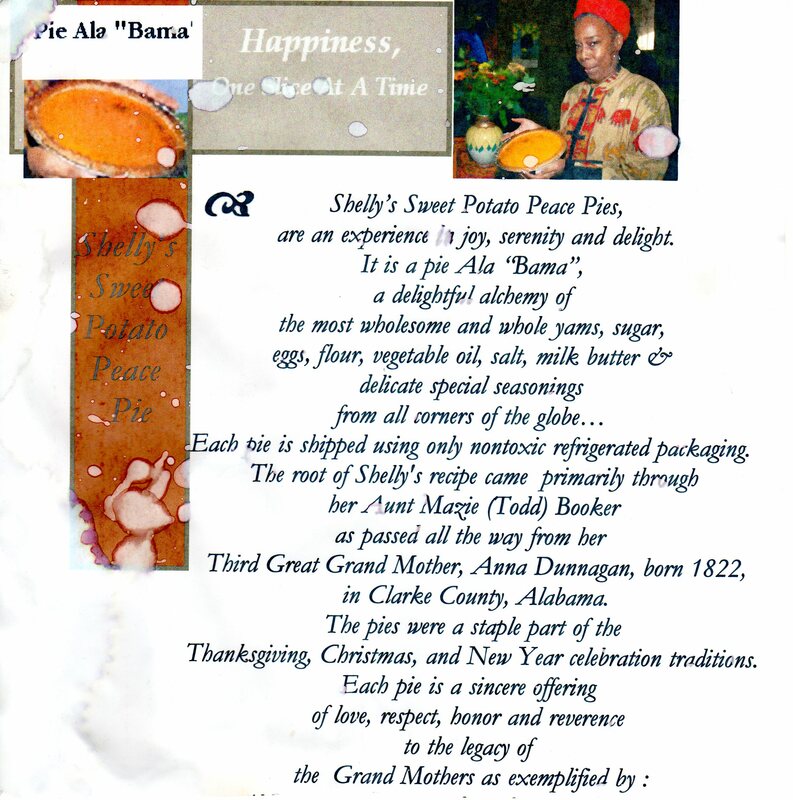 Shelly, had started selling her pies and had even attempted to freeze and ship one to my mom and me. I actually think this is where the paper came from. If I recall correctly, it was inside the box with the pie she shipped to us one of the first Christmas I spent in Las Vegas. My mom had flown out to spend the holiday with me, and Shelly wanted to make sure her pie was included in our celebration, even if she couldn’t be here. We didn’t get to enjoy that pie. When we opened the box, it looked as if a squirrel or some other pie loving critter had gotten inside the box and had a party in the pie. But I held on to the paper, as it told a story of the importance of the pies to Shelly. The recipe Shelly used had been passed down from her third great grandmother and was a tradition in her family. This tradition was one which she brought to my family as Christmas or Thanksgiving wasn’t complete without one (or more) of Shelly’s pies. I wish I had learned the recipe, but part of the enjoyment was having Shelly make them. Hanging in my kitchen is my other favorite food related memory of Shelly. It’s the Romare Bearden postcard of Falling Star, she gave me some years ago. Knowing the tea snob that I am, Shelly had found the perfect gift for her goddaughter, an assortment of loose leaf teas and this postcard. I put it in a frame and hung it in my kitchen to watch closely over my tins of tea, in the same way I envision Shelly watching over me. 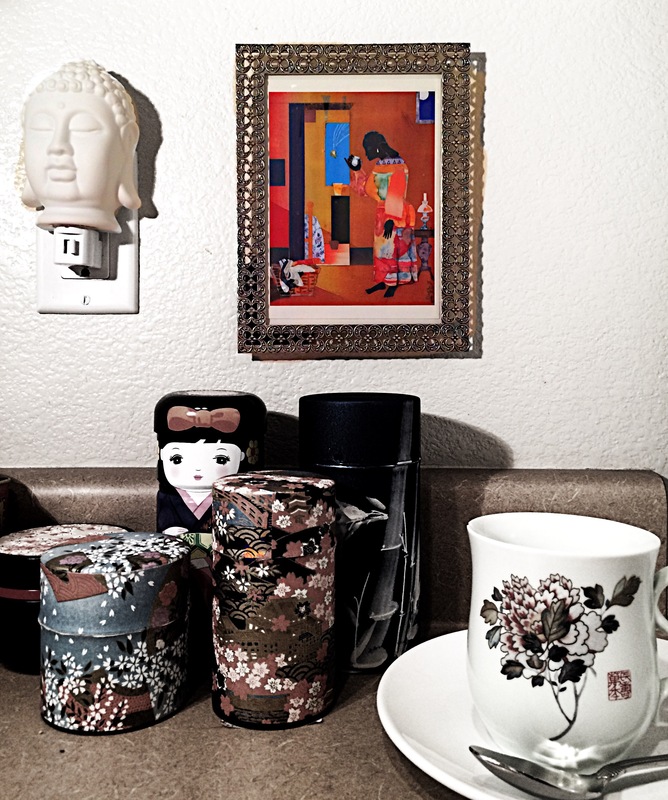 This entry was posted in My Ramblings and tagged death, Easter, Falling Star, family, godmother, life, love, peace, Romare Bearden, Shelly Todd, sweet potato pies, tea by greedygirlinlv. Bookmark the permalink. I am so grateful to read this post. It reminds me of the many years of friendship I shared with Shelly and her friends. Shelly was a rare friend. Someone who knew how to make each person feel special. Thank you for remembering my close personal friend and for sharing a slice of your years with her. You’re welcome and thank you for reading! With all the memories I have of her she will never be forgotten.